The name of the sport is never spoken in the entire film, but “Slamball” is a 2015 sport that eagle-eyed viewers will spot several times during the film. According to Back to the Future: The Official Book of the Complete Movie Trilogy, Slamball was intended to be a sport played in the 21st century in an anti-gravity field. Players would wear high-top electronic shoes that lit up when they entered that field to signal when they touched the game floor. Robert Zemekis invented Slamball and planned to show it being played, but it would have cost too much to film. However, the shoe design ended up being turned into Marty’s self-lacing shoes. The first reference to Slamball is in the upper-left corner of the USA Today front page. In the “Inside Sports” box, it says “Slamball playoffs begin”. Slamball playoffs are also mentioned below that in the “Newsline” box. It says the playoffs will begin “this evening in Denver”, which means the playoffs are starting on October 22, 2015. 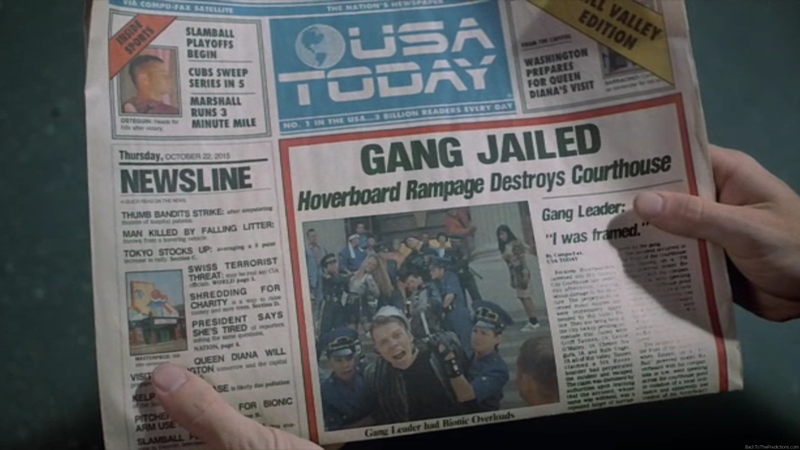 Slamball shows up again on the back cover of Grays Sports Almanac. It’s one of many, many sports listed inside the book. The inclusion of Slamball means the sport must have debuted sometime before 2001 in order to fall within the book’s 1950-2000 range of coverage. 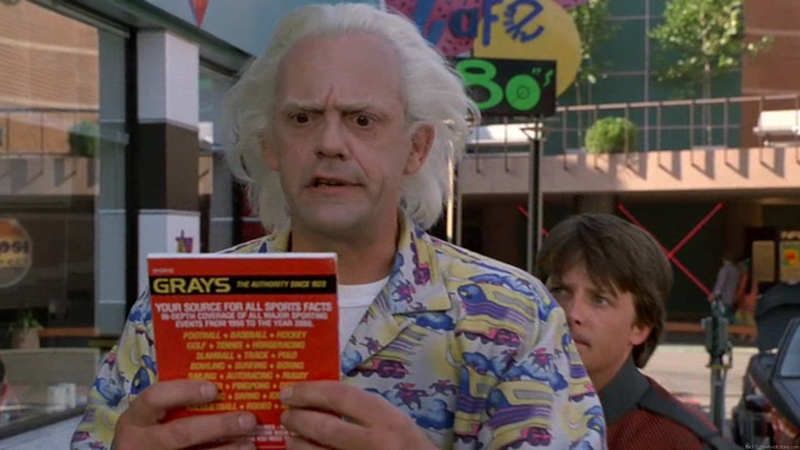 The final reference to Slamball in Back to the Future Part II is when Marty Sr. is talking to Needles. According to the on-screen captions, it is one of his favorite sports. You may be surprised to learn that Slamball actually exists! …or did exist. A game named “SlamBall™” was created in 2001 by Mason Gordon, who wanted to create a combination of sports that approximated a real-life video game. It was a form of basketball with four trampolines in front of each net and around the court edge. In 2002, it aired on The National Network (now Spike TV). After the 2003 season, Gordon and Warner Bros. Television had a disagreement and the league was dissolved. It resurfaced again in 2007 in Atlanta. A 2008 season was held at Universal Citywalk in Universal Studios, California and televised on Versus and several international networks. Although Slamball (or “SlamBall”) differs from how Robert Zemekis envisioned, the sport was never actually explained on screen and so we would accept any form of a slamball sport as an accurate prediction. However, the sport did not exist prior to 2001 and could not have been included in any form of Grays Sports Almanac. It also hasn’t had a season of competition since 2008, so wouldn’t be entering playoffs this month as USA Today indicates.